By now many know that over the last few weeks the Drudge Report suffered massive DDoS attacks, the first knocking the popular news aggregation site offline for about an hour-and-a-half, the second time it was unavailable periodically during about an hour time frame. What many did not catch because it only lasted for minutes, was on January 15, 2017, we started seeing chatter about the Drudge Report showing a cached version of it’s page with news from 10 days previously, from January 5, 2017. A look through Drudge’s archived pages shows that was what his paged looked like on January 5, 2017. Archives here, date and time of that original page here, as seen in the URL itself when you click the link. Just one day later, on January 16, 2017, we reloaded Steve Quayle’s site to see if he had posted anything new, and the date listed on his site, as well as the articles he linked to were from 1/12/16, showing a page that was four days old rather than his current page. As with the Drudge Report incident, the cached version of the site only last for minutes, then the updated live version was available again. Many services offer a way to keep a site online, even if the original server goes offline, such as “Always Online,” from Cloudfare, which “is a feature that caches a static version of your pages in case your server goes offline,” according to their website. Or the Google Cached Page service where “Google crawls the web and takes snapshots of each page as a backup just in case the current page is not available,” according to Cached View. As seen from the descriptions, the cached version of the pages are shown when a server goes offline or the current page is not available. In both cases, the sites in question, Quayle’s and Drudge’s, were only unavailable for minutes before the current live versions were available again, so short a time that none of us would have noticed had we not happened to click the links in that very short time frame. Both Drudge’s and Quayle’s websites have extraordinary capacity for traffic, so there is no reason their sites should have been showing cached versions or have gone offline even for a minute. 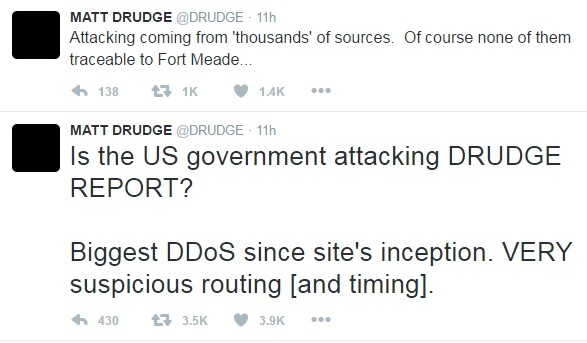 Almost like some entity was testing the ability to knock, heavily trafficked Independent Media sites, offline, as was done with the massive DDoS attacks against Drudge just weeks ago, where Matt Drudge himself asked if the U.S. Government was behind it. The timing of the Drudge DDoS attacks, then the latest strangeness of periodically not being able to access certain Independent Media sites, just to have them suddenly come back up again within minutes, then over the last two days, the examples shown above where for a very short time, two prominent sites were forced to show old cached versions before going live again, all happening leading up to Friday, the Day Trump is to be inaugurated, with attacks being planned, protesters organizing chaos in an attempt to prevent the inauguration, and weapons’ caches having been found close to the Inauguration location, was enough to cause concern. We already know from a reader this morning that Blue Lives Matter has reported that DC police are being prohibited from having their on-body cameras turned on during the inauguration protests, so if police have to arrest somebody, they can turn them on but they will be unable to provide camera footage of what led to the arrests. I reached out to a trusted ANP source and asked if TPTB were preparing for some type of Independent Media blackout if all hell was to break loose on Friday, leaving Americans with nothing but the mainstream media’s reporting of said events. The answer I received was not comforting as I was told to “remember the CIA and NSA have real control of the Internet,” and was asked “who is at war with Trump?” That is a reference to the tense back and forth going on right now between outgoing CIA director John Brennan and President-Elect Donald Trump. Law enforcement is on high alert for the inauguration, security tight, but they are expecting nearly a million people or more between the inauguration, the celebrations, and dozens upon dozens of groups planning protests, some of which have made it clear they have no problem using violent means. So while it is quite possible the day will move forward with nothing more than a few incidents here and there and a limited number of arrests, there is also a high chance that all hell could break loose…. the question here is whether Independent Media will be blacked out for a long enough period to make sure the MSM gets to spin it any way they want. Just in case, people should be prepared for an Independent News black out if chaos rules the day on Friday, January 20, 2017. Better to be prepared and have nothing happen than to have something happen and not be prepared. If ANP goes down for any reason, we will try to utilize my old political blog, Wake up America here.